More than just a summer jacket, the GX Sport Air 5 jacket is a versatile jacket featuring Cortech’s Aquatherm™ two-stage waterproof liner and 100g polyfill thermal liner. When the temperature rises these liners easily remove, and the Armor-Link 3 mesh shell makes sure the rider stays cool in the hottest conditions. 1680 denier Ballistic Polyester material and CE-approved armor in the elbows and shoulders keep the rider safe from abrasion and impact. Adjustable take-up straps at the bicep and forearm help to adjust the fit and keep the CE-approved armor fitting snugly. • Performance fit constructed using 600 denier Carbolex® polyester fabric and Armor-Link 3 mesh. • 1680 denier ballistic polyester in the shoulders, elbows, and forearms. • Accordion stretch panels at the waist and elbow, plus stretch fabric built into the underarms for added comfort and range of motion. • Mandarin-style collar and adjustable zippered cuffs feature soft microfiber trim. 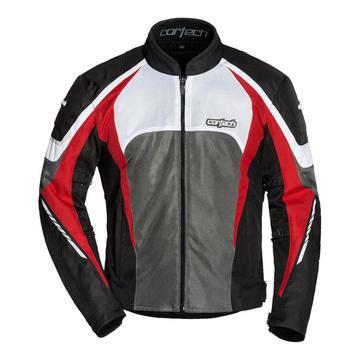 • Pre-curved and rotated sleeves provide comfort and reduce rider fatigue. • Adjustable take-up straps at the bicep and inside forearm for a custom fit. • 360 degree Phoslite® reflective piping, panels, and Cortech's signature reflective rear triangle help increase nighttime visibility. • Newly designed CE-approved Armadillo® armor in the elbow and shoulder with a revised articulated triple-density back protector. • Aquatherm™ two-stage removable waterproof liner and insulated vest liner. • Two hand front pockets, inside chest map pocket, with storage pocket, and mobile device pocket in the jacket shell, liner, and vest. • Adjustable waist belts with TPR pulls help fine tune the fit. • Includes jacket/pant 8" zipper attachment with pant side included. • Equipped with ESO™ zippers including locking Cortech main zipper.